This Saturday, Nov. 17, Wake Forest Football will play their final home game of the season against Pittsburgh with a kickoff time set at noon. The kickoff time is causing concern for many, as students plan to partake in the “Senior Fifth” tradition through which they set a goal to finish a fifth of liquor between midnight and kickoff, a tradition made more problematic by earlier kickoff times. As a result, many facets of university administration — including University Police, student Emergency Medical Services (EMS) and the Thrive Office — have been preparing for the game through preventative campaigns, and express concern about student safety this weekend. While the early kickoff time is causing concern for many, others note that it may not have as much of an impact as one would initially think, as historical data does not necessarily show that later game times results in fewer students seeking medical care. Most surprisingly, the most recent year that the senior fifth game had a noon kickoff time was in 2013 versus Clemson, for which only four students sought medical care for intoxication. When compared to the 7 p.m. and later kickoff games in recent years, this number is not significantly higher than for evening games. Aaron cites factors outside of the kickoff time for having contributed to lower numbers in students seeking medical care for intoxication, such as poster campaigns, alcohol education initiatives and administrative partnerships with Greek organizations and Student Government. 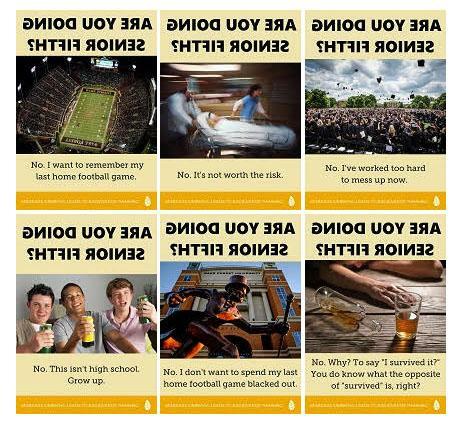 The “backwards thinking” poster campaign, which many students may see around campus with backwards lettering to draw attention, is a notable effort by University officials. The “Senior Fifth” tradition is not unique to Wake Forest, and can be found at other schools such as the University of Virginia and UNC-Chapel Hill. It is always placed at the last home game of the season for which students are on campus. For a student to consume a fifth of liquor, or 17 shots, between midnight and noon, they would have to average about 1.4 shots an hour. This would result in a BAC level of 0.5 for an average female and 0.35 for an average male. While some continue to worry about students completing the tradition in such a short time span, others have expressed that the earlier time will encourage less people to take part in the first place. “I think fewer people will do Senior Fifth, because the game’s so early,” said senior Lizzie Waid. Despite the time frame of Senior Fifth being constricted to the day of the football game, Aaron noted that the tradition may impact the prior Friday and following Sunday as well. “The entire weekend is a higher-risk weekend compared to most other weekends,” he said. The kickoff time of the game was set by the ACC and announced on Nov. 5. The university has no say in the time.